Record numbers for todays Larkling ride. Perhaps it was the promise of a day of sunshine and no (real) hills that attracted the masses? At the start we had: Simon, Sue, Alison, Oliver, Greg, Dave, Jen, Kevin, Mike, Alan, Christine, Julia and a couple of others whose names I am still trying to obtain :) I think there were about 13 riders in all, and that was without a few of the regulars who were out riding in Majorca. Simon led us out and Alison brought up the rear, making sure none of the newbies got left behind. I don’t know if the wind was behind us but it felt like I was freewheeling most of the way out, and I could hear lots of freewheeling behind me. Indeed Simon said he wasn’t even using his motor! We headed out through Goostrey and Lach Dennis and the pretty village of Davenham. Just after Davenham we had the first of the day’s mechanicals. Someone dropped their chain and it became jammed between the frame and the inner chainring. This took some time to gouge out, leaving several people with oily fingers! At the top of one of the climbs Oliver noticed his seatpost had been slowly dropping, so he faffed with that for a bit. There were a couple of off road wooded sections which fortunately were not too muddy this time. 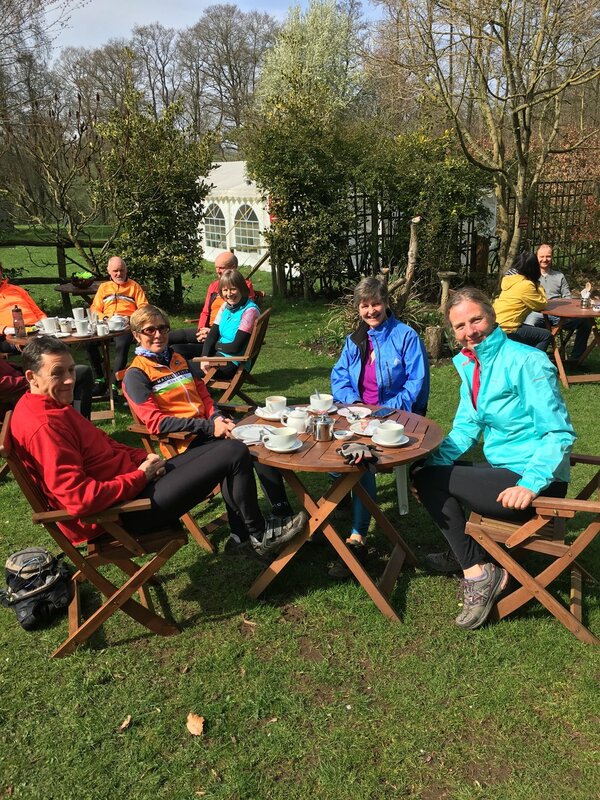 We arrived at Stonyford Cottage Tea Room 27 miles in. The Larks looked like they had been there for some time. The place was packed already. The guy at the counter didn’t seem terribly pleased to see another large group of cyclists. This was going to take a while. I forgot about this and ordered a hot panini. The owner said he was only doing 3 beans on toast, rather than the 7 requested. Fair play. Still, it was a nice day to be sat outside. Phil turned up on his own after about 20 minutes after having got lost. Watching the non moving queue he decided not to even bother with food. Oliver had a quick coffee and a millionaires shortcake and the headed back with the Larks. Eventually we headed out, through “beautiful Winnington” and soon we got to Anderton Boat Lift, then the fun of the woodland trails. I think Phil got something caught in his rear mech which needed extracting. On through Wincham, Plumley and Lower Peover. Around here we started seeing marshals for a local time trial (Withington Wheelers Open 25) and we were temporarily on its course. Up through to Chelford there were riders blasting past in both directions with the unmistakable roar of carbon disc wheels. Heading back to Macc it was the final push up Pexhill. Stuart set the pace, with Sue hot on his heels. I just about managed to hang on to her. At the top we regrouped and then went our separate ways. A nice ride on a lovely spring day. Good to see lots of new faces out. The usual thanks go to Chris and Simon, and Alison for looking after the new riders.